It is easy to see why ukuleles are such a popular instrument for people who want to take up a new musical hobby. They’re relatively affordable, portable and don’t need amplification. You can pick up a ukulele and relatively quickly start to play songs. As they’re on the affordable end of the market when you consider many alternative instruments, there are a lot of different choices. Our guide to choosing the best ukulele for beginners is designed to help you to avoid the pitfalls and to make sense of some of the terminology and different types of ukulele, as well as the best brands. What Are the Best Ukulele Brands? What Are the Best Ukuleles for Beginners? What Are the Different Ukulele Sizes? What Size Ukulele Is Best for a Beginner? What Materials Are Ukuleles Made of? How Much to Spend on a Beginner Ukulele? How Much Does a Good Ukulele Cost? What to Look for In a Ukulele for Beginners? There are a few ukulele brands which dominate the market. Just like with guitars, there are mainstream brands such as Fender which dominate, there is the same phenomenon within ukuleles. Their ranges tend to be quite big, and choosing between the many different models can be challenging. Whether you’re looking for your first ukulele or you want to know what ukulele to buy for children as a gift or to spark their interest, making the right choice can be the difference between sticking with the hobby and becoming something of a virtuoso, or struggling and giving up in the first few weeks. We’ve put together a list of the top ukulele brands out there for beginners. The brands on our list aren’t necessarily the brands which would be most suitable for a professional or touring musician, but they are excellent for those just getting started. All of these brands have at least some good ukuleles which are affordable, good quality and relatively simple to play. Many of the brands we’ve mentioned have numerous high-quality options for beginners, which we’ve also reviewed later in the article to give specific examples of some of the options out there. Kala are a very prolific manufacturer of ukuleles. 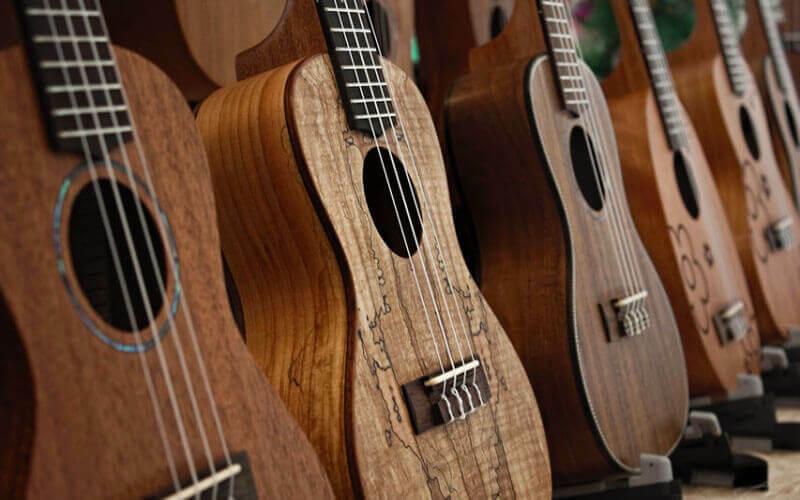 They are based in California, rather than Hawaii, and the brand has turned love of ukuleles into a huge range with something for everyone within. They aren’t stopping, either. Kala are constantly releasing new models, with four new ukuleles released just in 2018. This range of ukuleles has everything from beginner, affordable models to very expensive professional models, and their range features some of the best-selling options out there. The list of ukulele players who use Kala is huge, showing the faith in this massive brand. Donner are manufacturers of a huge amount of different instruments including guitars. Their ukuleles are of good quality, and though they were founded in 2012, so don’t have the long history some of the other brands on the list have to offer. However, some of their ukuleles are under $100 and great options for beginners. Donner also have some models which are quite unusual including electric bass ukuleles, not as great for beginners but part of a large and interesting range. Lohanu is a company from Canada, which is not necessarily a country you would associate with ukuleles! However, the brand has definitely developed its ukulele with the spirit of Hawaii in mind. The brand name itself is even made as a combination of three Hawaiian words. Thousands of purchases, hundreds of positive reviews and some of the top selling models for beginners on Amazon and elsewhere online make this a brilliant brand. They even offer a lifetime warranty on their products. Hricane is a brand with a slightly smaller range, though a couple of their ukuleles offer a brilliant choice for beginners. They have different sizes of ukulele as well as different materials including Koa, which can give a very traditional sound to your uke as it is the Hawaiian wood originally used to make these instruments. As well as a relatively low cost, the Hricane brand are proud of their craftsmanship and how long-lasting and great-sounding the brand is. In their words, “there are more than 100 processes in the production of the ukulele hurricane and it DOES NOT allow the least negligence in every process”. Pomaikai is a brand which may cause a little controversy being on the list. If we were simply looking for the very best ukulele models then Pomaikai may not get on our ‘best of’ list. The fact is that a huge amount of the range provided by this brand are available under $50, and thus can be a decent choice for beginners on a budget. Some of the models are also very suitable for children due to their compact size. Plenty of aspiring players are getting their start with a cheap but well-made Pomaikai uke. This is a brand you probably will have heard of, but not necessarily when talking about ukuleles! Fender have a history of many decades making guitars, and some of the most popular and iconic electric guitars are made by this brand. They’re also known for producing some of the best electric guitars for beginners. Their expertise in creating quality instruments has transferred brilliantly as they have launched some excellent ukuleles. Some of these ukes are good options for beginners, and though a lot of the designs have references to guitars, such as a telecaster style headstock, the ukuleles have a good tone and are comfortably playable. Lanikai is a brand that is located on the Hawaiian island of Oahu. Their instruments are the reflection of the what ukulele is all about, which is probably why their motto is ‘Makes me happy‘. In the grand scheme of things, you could say that Lanikai ukes belong anywhere from the entry level segment to the high-end category. Their more affordable models are by far their most popular product. If you ask some of the more experienced ukulele players, they will probably tell you that Mahalo was the brand of their first ukulele. Compared to other manufacturers we have listed, and will list later, Mahalo is more dominant in the beginner segment of the market. As a matter of fact, they don’t build anything else. Mahalo is known for effort they put in into designing and building great beginner ukuleles. This is the reason why we included them on our list. While Hola! is one of those brands which are not that well known, their ukuleles are becoming more and more popular. This is mostly true for beginner players looking for their first instrument. In our opinion, their entry level stuff is decent, especially considering the price. Luna instruments are well known and include a variety of different types. In other words, this brand doesn’t work exclusively with ukuleles. With that in mind, it’s worth saying that their reputation is good no matter which type of instrument you look at. Ukuleles made by Luna are solid, no matter which segment you look at. They make awesome high-end ukes, but also good beginner models. If you are familiar with acoustic guitars, you’ve probably heard of Oscar Schmidt. Their instruments are usually top quality stuff that is affordable compared to their immediate competition. Same goes for their ukuleles. While the brand has limited exposure, anyone who has an Oscar Schmidt instrument is almost always happy with their choice. While they are not as widely known as Kala, ADM is the type of brand that produces solid ukuleles in the entry level range of the market. If you look at their current lineup, functionality seems to be the name of the game. As a beginner, getting one of ADM’s ukuleles is an option you should consider. Sawtooth ukuleles are primarily aimed at the entry level user. The Sawtooth brand isn’t really known for their higher end ukes, but their beginner models are creating waves on the market. Overall, the quality is there and makes Sawtooth ukes a real bargain compared to some other brands. If you need an affordable ukulele, we can recommend Sawtooth as a viable option. Diamond Head, much like the previous two brands we talked about, is a relatively unknown ukulele manufacturer outside the affordable range. Their best work comes in form of traditional, entry level ukuleles that focus on delivering sound over aesthetics. The quality of Diamond Head instruments is good in most cases. You can expect great fit and finish, although smaller craftsmanship errors are a possibility. Cordoba is a very prominent brand in the world of high-end classical guitars. Their knowledge and experience translated well when they decided to start building ukuleles. Fortunately for us, Cordoba offers a very nice selection of entry level ukes as well as medium range ones. You can expect quality in every aspect of the instrument with this brand. Though we’ve featured many of the top brands out there, you may still be left asking “what is the best ukulele for the money?” or “what is the best ukulele to learn on?”. Finding a ukulele brand is one thing, but choosing the actual model which is going to be the best beginner ukulele for you to get started with is another issue, which is why we’ve featured reviews of specific models of uke to help you to make your choice and compare the top options. When it comes to soprano ukuleles, Kala KA-15S is one of the most popular choices for beginners and advanced players alike. It features all mahogany body that is put together nicely, making it a solid instrument. The tone you can expect is balanced, crispy and consistent. Compared to other beginner ukuleles, Kala KA-15S punches above its weight class. The best thing about this model is just how affordable it is. Great tone that is balanced across the range. Might be rough around the edges. Expect it to need proper setup. Overall, this is the type of ukulele that you will keep up with you as you grow your skill and experience. It’s reliable, affordable and most importantly, sounds great. LU-21 is one of those super popular soprano ukuleles which most beginners and intermediate players turn to. The main reason for this is its great build quality and interesting choice of materials. Lanikai went with a full nato body, which is not that common these days. The tone of this ukulele is great, to say the least. It offers a set of qualities which define what soprano ukuleles are all about. Great build quality and craftsmanship. Comes with a good set of strings. Can arrive a bit rough around the edges. At the upper limit of affordable segment. Lanikai LU-21 is a great ukulele that has proven its worth numerous times so far. Lanikai’s quality control is generally great, but sometimes they slip up. Even so, this little flaw is completely overshadowed by the sheer quality of this model. This Lanikai model might share a very similar name with the one we just talked about, however this is the concert version. Overall, you could say this fella is a scaled-up LU-21, and you wouldn’t be wrong. We are talking same all-nato body construction, same white binding and mare. The main difference aside from its larger size is in the neck and its wider frets. The sound is a bit more resonant and louder in volume. Great tone with a lot of depth. Action sits a bit high for our taste. Minor craftsmanship errors are possible. Being so like the LU-21, the LU-21C comes with the same minor issues. With that said, it’s the best concert ukulele in its category. For the most part, it can compete with instruments in a higher segment, which only makes its value that much greater. One look at this uke will tell you that we are dealing with a very simple and basic model. Mahalo MK1TBR Kahiko Series is among the most affordable ukuleles that we are comfortable recommending. The build quality is decent all things considered, and the tone is on point. Its lack of aesthetic details shouldn’t fool you. Mahalo MK1TBR is among the best ukuleles for beginners. Decent build quality and craftsmanship. Might require a change of strings. Considering the price these go for, we can’t really criticize it too much. Sure, we’d like to see a bit more aesthetic details in there, but that’s not a deal breaker. Truth is that beginners who are working with extremely tight budgets have a good option on the market. One of Mahalo concert models that deserve a mention is the MH2 from Hano Series. The whole instrument is beautiful, especially if you decide to go for some of the more vibrant finishes. Tone wood of choice for this model is Segnon – a very uncommon type of wood. With that said, the tone of this ukulele is well balanced and the instrument is very playable. When it comes to price, it’s among the cheapest concert ukes in its category. Interesting choice of tone wood. Inconsistent intonation right out of the box. While it’s not the most refined concert uke out there, Mahalo Hano Series MH2 compensates that with a rather decent performance. For the money, you will hardly find an instrument that sounds and looks as good as this one. One of the most interesting soprano ukuleles in Hola!’s lineup is the HM-21. It’s an all maple design that offers decent performance. The body is solid, while its mahogany neck sports a comfortable contour. In terms of tone, we are looking at a good balance across the range with a rather crispy sound. The only thing that you need to keep in mind is that few years down the road, you might have to do a setup job. Some arrive with small craftsmanship errors. Intonation might need work right out of the box. At the end of the day, Hola! HM-21 is a very decent ukulele that comes at a very low price. It might not be something you would want to perform on stage with, but it’s more that good for enthusiasts and beginners. One quick glance at this uke will tell you that it’s different. The body is made of mahogany and features several neat details that give the Honu a rather refined look. Luna went full nine yards when it comes to craftsmanship on this thing. On top of that, this ukulele brings a very nice tone to the table, one which punches above its price range. Speaking of which, this is a bit more expensive model compared to the most we have covered so far, but it’s more than worth the extra cost. Might need better strings if you want to experience its fullest potential. This is a great ukulele, both in terms of tone and craftsmanship. Luna really went above and beyond, especially considering the price. While it’s a bit more expensive, you rarely see this level of details and build quality in this price range. 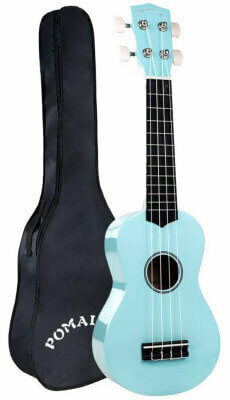 Another great model from Luna comes in form of Malu concert ukulele. Much like the one we already reviewed, this Luna uke brings a combination of great sound and intricate detailing at a reasonable price. The entire ukulele is made mahogany. The sound box features word ‘peace’ engraved in various languages around the sound hole. Speaking of which, the sound hole itself comes in the shape of a peace sign. That doesn’t affect the tone. In fact, this uke has an awesome sound. Intricate detailing on the top. Factory strings might need to be swapped. As far as concert ukuleles go, this has got to be one of the most interesting models you can get for a reasonable amount of money. Luna really does a great job at taking their ukes to a next level. If you can swing it, we recommend this Luna concert. By most standards, you could say that OU5 is a more traditional ukulele. It is entirely made of koa, which is something usually associated with old-school ukes. The neck is a Nyatoh design, and the whole thing just feels great. One of the nicer details we’ve noticed is the abalone binding on the body as well as the neck. Tone it offers is bright, crispy and overall versatile. Only real issue with this ukulele is the price. It’s a bit more expensive, but the level of craftsmanship and tone are well worth the investment. Great intonation right out of the box. When Washburn took over Oscar Schmidt, they boosted the quality control of these instruments significantly. Thanks to that, OU5 brings a great balance of quality and tone which makes it a perfect choice for beginners. DU-200C Deluxe is a more traditional concert ukulele that was designed to give you all the benefits of this uke size. The entire instrument is made of mahogany, which brings a lot of clarity and resonance in terms of tonal qualities. The whole thing is solid from top to bottom, making it one of the most affordable full-sized concert ukuleles you can find now. Body shape designed to enhance the concert signature tone. Strings might need to be changed. If you really look at it, the DU-200C is a great value for the money. Even more so if you’re in need of a decent ukulele. The brand itself may not be the best ukulele brand of them all, but they sure know how to make a quality affordable instrument. Cordoba 15TM is a tenor ukulele, probably the best ukulele in this price range. The entire thing is made of mahogany and features a bright, clean finish. Cordoba 15TM brings a great tone to the table. It’s bright, but also rich in the low end, which is a trademark of good tenors. The price for this model is surprising considering all it must offer. Cordoba placed it right on the upper edge of the affordable category, and we can say it punches above this price range. This is truly one of the best tenor ukuleles on the market, period. The quality is there, and so being a rich tonal spectrum. If you are more interested in fingerpicking, Cordoba 15TM is a great choice. Continuing with awesome Cordoba ukes, we have Cordoba 20CM. This uke reinforces the fact that Cordoba is one of the top ukulele brands now. We are talking impeccable build quality, all mahogany body, and a kicking set of strings made by Aquila Night. Tone, as you can imagine, is on point. There’s resonance, volume, and clarity which defines what we associate with a great ukulele sound. With that said, it’s among the most expensive ukuleles we are comfortable recommending to a beginner. Great tone that features good range and clarity. Great set of strings right out of the box. Priced on the very edge of the affordable range. While it’s more expensive, this ukulele is perfect for those beginners who want to ‘future-proof’ their inventory. It’s really one of the best concert ukes in its category, and one that will last you a long time. If you are looking for above average quality, this is the uke for you. This is a beginner ukulele which has made some waves in recent years including a huge amount of positive reviews. Their model is available in many different variations, so you can purchase the ukulele in soprano, concert or tenor designs, and in two different types of wood; Sapele or Koa. These both have their own tonal qualities. A lot of people opt for Koa as it is Hawaiian in origin, just like the instrument itself. Hricane offer 12 months warranty against defects and a 30-day money-back guarantee after purchasing, as well as 24/7 customer service. It is unlikely that you will need it, as this is a high quality ukulele with excellent chrome plated tuning pegs keep it in tune for longer so you don’t find yourself fiddling around with the tuning too much. This can be frustrating and confusing for beginners. Great customer service and warranty. Doesn’t come with accessories other than gig bag. The Hricane ukulele looks great, and has a wonderful tone whether you choose Sapele, which has a bit of a brighter sound, or the traditional Koa wood. It ships with a protective gig bag and offers some exceptional value for money as one of the top ukuleles under $100. The Donner brand is an interesting one due to the fact that ukuleles aren’t necessarily the speciality. Instead, they offer a wide range of brilliant value instruments. That said, their ukuleles are definitely extremely strong, and the DUC-1 is an excellent ukulele with a full tone. The sound of a ukulele comes down to the workmanship and Donner are proud of the fact that they screen their wood and even let it dry naturally over a period of years. Their attention to detail is great for a relatively affordable brand, which can make a superb option for beginners. Made out of high quality mahogany. Great tone from the quality softwood. Not as professional as some other models. Features of this DUC-1 model include a bright tone brought about by the mahogany body. It has a comfortable rosewood bridge and fretboard which feels great for those whose fingers aren’t totally used to the sensation yet. It also ships with a ukulele bag, a strap, extra strings and a digital tuner. The design of the Fender Venice instantly makes it stand out. You can tell that this is a ukulele manufactured by a guitar brand, and the telecaster headstock is unmistakably Fender! If you are a guitar lover who wants to move on to ukulele this could be for you, and though they’re not a manufacturer with the ukulele tradition of some competitors, the Venice ukulele is exceptionally reviewed. Quirky Fender design with tele headstock. Ships with a range of accessories. Not made of traditional ukulele wood. Like many of the other top beginner ukuleles on this list, the Venice ships as a bundle with lots of extras including a gig bag (either hard case or soft case design) and a tuner. The wood is basswood which is what is used on a lot of the more affordable guitars and other acoustic instruments and though it is not traditional for ukuleles the build quality is great, as you would expect from Fender. Pomaikai is a brand offering a decent range of ukuleles. They’re not likely to be seen used on stage at big festivals any time soon, but they are still a good option for many beginners, especially kids due to the small size of the soprano design and the fact that the small fretboard suits smaller hands. Tone could be better with different wood. Not as hard-wearing as other models. There are improvements which could be made on this ukulele. For instance, the basswood design is good, but by no means amazing for tone. However, features like this enable this ukulele to stay cheap, and make it one of the best ukuleles under $50, gear for starting your kids on their path to being a ukulele virtuoso. The different sizes of ukuleles are referred to as a few different types. These types are based on the tonal qualities and the way the ukuleles project. Much like the range of voices in a choir, the depth of the Ukulele tone affects what it is called and whether it is appropriate for your needs. The smallest and highest pitched, with very little bass. This is actually one of the most popular designs and is usually what people associate with the sound of a ukulele, it is bright and high pitched. These can be tough to play for bigger hands. A slightly larger design with a long neck, which makes it easier to play up and down the frets. The concert uke size is arguably a little easier to start playing due to this space. The tone isn’t too far from the soprano model, but it has a little more depth. Tenor ukuleles are growing in popularity as they are good instruments for playing solo, with a wide range of frequencies covered and more low end that give them the sound and tone, which is similar to a classical guitar in many ways. Though tenor ukes aren’t the most popular for beginners, there are plenty of good options if you wish to play something with a bit more of a ‘full’ sound. Baritone ukes have grown a little in popularity due to the fact that they are more widely available, but they are far from the most popular model, especially for beginners. They are often tuned differently, which makes it harder to transfer to other ukulele models in the future as you will be used to different chord shapes and style. Tonally, they’re similar to a classical guitar, so they’re suitable if you are looking for this kind of tone. If wish to learn more about this type of uke, you can check out a special article on our website, in which we review some of the best baritone ukuleles available on the market. What Type of Ukulele Is Best for Beginners? There is no single ‘best’ ukulele type for beginners. Though baritone ukuleles are unusual for starting to learn to play, any of the other three types, soprano, concert or tenor, are viable options. If you’re of a larger build with big hands then the soprano ukulele might feel a little bit small, especially on the fretboard. The bright tone is popular, and soprano ukuleles are often the cheapest options, so they’re a good choice for younger beginners. Concert and tenor ukuleles both have a little bit of a fuller sound in terms of their depth, and give more room on the fretboard. If you’re worried that size could be an issue, these models could be worth considering. Whichever you opt for, you need to know you will be comfortable playing. The key is that you will need to get used to the hand positions and being able to fret properly. Soprano, concert and tenor ukuleles all have the same tuning, so you will be able to transfer to another of these types in the future with ease. Materials of an instrument are always important. Not only is this the case because you should be looking for a ukulele which lasts a long period of time, but also because the type of wood (and other materials) makes a big difference in terms of the tone. The wood used on an acoustic instrument has a big impact on the sound. It is normal to have hardwood at the sides and back, whereas the top of the ukulele often has softwood on it for a better resonance. This design is popular as it helps the instrument to ring out and project, which sounds better to most. The wood on the fretboard has an effect too, mainly in terms of the comfort for the player, and how easy it is to care for. For instance, rosewood is very popular among guitars and ukuleles for the fretboard material. The wood which provides the tone for the instrument varies massively from model to model. A lot of the top rated ukuleles make use of Koa wood. Koa was a popular wood in Hawaii when this instrument was first invented, so the ‘traditional’ sound of a ukulele may well utilize this type of wood. Whether it is the best or not is an area of some debate, but it is one of the things that can make a ukulele unique, so a lot of people like to opt for Koa wood. There are plenty of other woods used including mahogany, cedar, spruce and rosewood. The truth is that one is not necessarily ‘better’ than the others. All tonewoods have their own charm, and they all have their own tonal qualities, of course. The truth is that for a beginner, this isn’t going to be the main concern. Something comfortable to play is probably more important when choosing your very first ukulele. The amount you will spend on a ukulele will be quite a unique and individual choice. It depends not only on how much you feel you can afford, but should take into account numerous other factors. For instance, if you are buying a child’s ukulele to see if they take up the hobby, don’t spend hundreds and hundreds of dollars if you don’t feel it will see long term use. It is better to purchase an affordable option in these circumstances and see how it goes. The decent quality ukuleles tend to cost $50 or more, even for a small soprano ukulele. There are models out there which can cost just $20 but this is unlikely to provide any quality. Playing a ukulele which is poorly built can also make it less likely that you stick with the hobby. The top ukulele brands tend to have some options which are pretty affordable, and most have an option for under $100. In fact, many of the best ukuleles under $100 are suitable for beginner and intermediate players. Ukuleles are among the cheapest instruments to get started with, and while some professional models (the most expensive ukulele brands) can cost up to $500 or even more, most beginners won’t be interested in these. What are the criteria for a good quality ukulele? What features are best for a beginner? There is a big market for ukuleles for beginners, due to the popularity of the instrument for hobbyists. 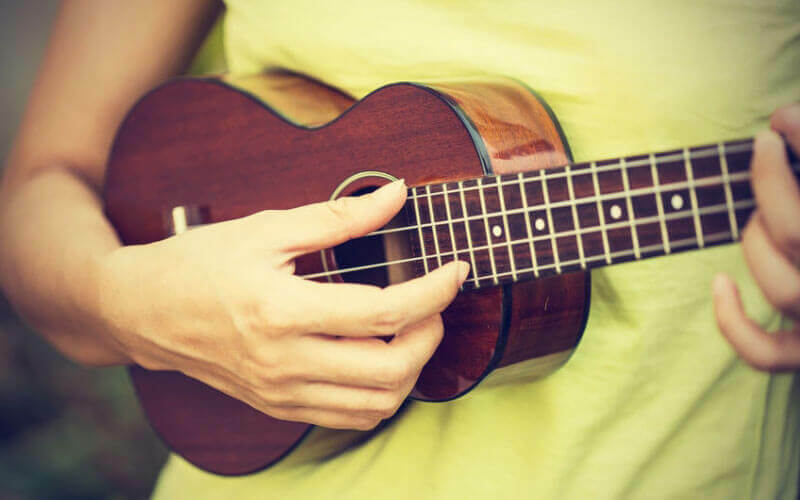 Because of this, ukuleles are often sold as beginner kits, where not only the instrument itself is included, but extras such as a gig bag, tuner and sometimes even lessons can be included. Some instruments can be more temperamental than others. A reliable instrument is unlikely to break, won’t require new strings all the time and will be good at staying in tune. These are all very helpful features, especially for beginners who may not be overly comfortable with tuning, for instance. For more information, check out this simple ukulele tuning guide. While it’s not our top criteria for any instrument, we normally do fall in love with instruments based on their looks. This just seems to be human instinct! The design of your ukulele is important, and will help you to want to play it and take pride in your instrument. Some ukuleles have a lot of different options in terms of colors. For adults, this can mean choosing the finish of your wood, but for kids there can be some extra fun added with quirky painted designs and block colors. Who doesn’t want a pink ukulele? This is a little bit of an abstract concept, and can be hard to pinpoint. In the age of consumer reviews, though, it is easy to see whether or not people find a ukulele easy to start playing and get to grips with or not. A comfortable fretboard and neck are pivotal to this, as is the size of the instrument itself. It is worth taking into account when reading ukulele reviews. This is largely the purpose of this article. The brand is absolutely vital, not only does it have an impact on the quality of a product and the customer support you will receive, a good brand can mean a higher resale value. With any instrument, it is a bonus if you can sell it on for a good price, whether you are moving onto a better model or you have simply lost interest. See your instrument as an investment. All of these features are important but the only way to make a decision is to look at some brands and models and see what is best for your own unique needs. As they are one of the cheapest models to purchase, ukuleles are also one of the cheapest to manufacture, meaning lots of brands have dipped their toe into the ukulele world. The fact that there are a number of different varieties and designs gives you a world of choice, and this article is designed to help you decipher all of these varieties and work out which is most suitable for you. While many are looking for an affordable ukulele for their first, this only really makes sense if you aren’t certain you will continue with the hobby, or if you are just looking for more of a product to mess around with. If you do stretch to a product which is a little more expensive, it is likely to hold its value a little better. In terms of the best ukulele brands, there are so many out there to decide between, and there will also be an element of personal preference, as you decide whether you want a classical design and a ukulele made of traditional materials (a brand like Kala) or something a bit more modern and quirky (Fender, for example). Choices on design, tonewood and size are key to the decision you will end up making. Whichever ukulele you ultimately end up choosing, spending a little time evaluating your brand options can help you to make the right choice and stick with the hobby. For a beginner, developing a little understanding of features before deciding can give you a big insight into your future of playing uke.